Peavey Field Park	Aside from the occasional buzz of traffic, Peavey is a quiet urban playland just South of Downtown. 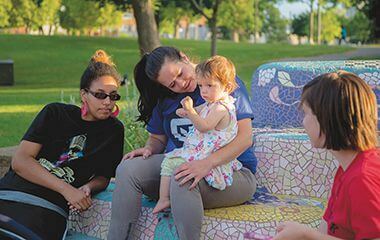 Master Plan: After two years of extensive community engagement, the Peavey Park Master Plan was approved in 2016 as part of the South Service Area Master Plan. 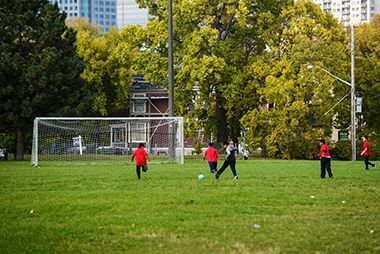 The Peavey Park Master Plan will guide outdoor park improvements at Peavey Park for the next 20-30 years. Click the link below to view the master plan. Name: The park was named for Frank H. Peavey whose grandchildren donated the first 3.44 acres of land for the park. The name was stipulated in the deed to the land given to the park board. Peavey was prominent in the grain trade in Minneapolis. Like Elliot Park, Washburn Fair Oaks and Dorilus Morrison Park, the park was once the site of the namesake’s home. Land for the original 3.44-acre park was donated by the four children of Mrs. Mary D. Wells, the daughter of Frank Peavey, on November 4, 1927. The original park site was on East 22nd Street from Park Avenue to Columbus Avenue with 290 feet of frontage on prestigious Park Avenue. The board estimated the value of the donation at the time at $28,000. The donation of the land came twenty years after Frederick Wells and others had petitioned the park board to acquire for park purposes the land directly north of the Peavey estate on Franklin Avenue between Park and Columbus. The park board approved the acquisition on the conditions that it could acquire the land at a satisfactory price and that area residents would agree to advance the money to buy the land and be repaid over ten years. Following that original commitment to acquire the land, the issue dropped out of park board proceedings. It resurfaced in the 1925 annual report when it was noted that Mr. F. B. Wells, presumably Peavey’s son-in-law, had offered to donate the former Peavey house and property at the corner of Park and 22nd for park purposes. Park Superintendent Theodore Wirth expressed reservations that the plan would work because of the cost of acquiring adjacent land and the cost of maintaining the buildings offered. Once the donation was accepted from the Peavey grandchildren in 1927, the Peavey home was removed from the site. One small building was left, which provided the “beginning of a very fine neighborhood playground” according to the park board’s 1927 annual report. 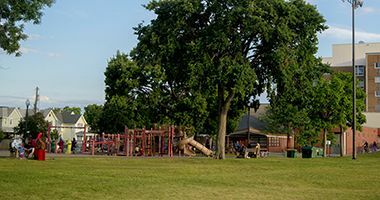 From the time it was donated, park superintendent Theodore Wirth hoped that the land would form the “nucleus” of a small playground park and hoped additional land could be secured for the park. In fact, the park has more than doubled in size since 1927. In 1941, the park board acquired four lots, one-half acre, adjacent to the original park from the state at no cost. The lots had been forfeited to the state for failure to pay taxes. The park was expanded more dramatically in 1947 when the park board purchased by condemnation 2.8 acres in 22 lots east to Chicago Avenue at a cost of $223,000. The parcel acquired was much smaller than the park board had intended when it sought bond funds in 1946 to expand the park by as much as eight acres. The park expanded slightly again in 1949, when the city turned over to the park board the fire station at the corner of Columbus and 22nd. The next addition to the park came in 1956 when the park was expanded by another .68 acre, in part through the vacation of Columbus Avenue through the park. 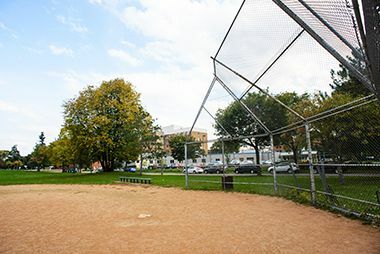 The final addition to the park occurred in 1992 when the park board acquired two lots at the corner of Franklin and Chicago with funds from the National Park Service. The liquor store on the corner was demolished and the site was incorporated into the park. In the lean years to come nothing would be done to improve the park. From 1935 to 1937 the park board did manage to grade the fields for a skating rink, surface the field with clay and loam, and plant some trees, but that was only accomplished through state and federal work-relief programs. The purchase of land to expand Peavey Park in 1947 was financed by city bonds, however, the first dime of its own money the park board spent on improving Peavey Park was $15 in 1949. That was the year that Peavey Park replaced Farview Park on the roster of eight parks that participated in community sings. Another $50 was spent on the park in 1950, until, in 1956, the park board secured $180,000, divided between bonds and neighborhood assessments, to improve the park. From 1956 to 1958, the park was graded, ball fields were built, tennis courts and a wading pool were installed, and a small shelter was built. The shelter had garage-type self-storing doors that could be opened in the summer and closed in winter to serve as a warming house. In 1971, the park board seriously considered a proposal to locate a new American Indian Center in the park, but ultimately decided that it wasn’t appropriate to alter the park board’s land policy to permit a privately owned building on park land. Instead the center was built on the site of a former school at Franklin and Bloomington, a few blocks east of Peavey Park, a site that the Urban American Indian Center Board ultimately preferred. The 1958 shelter was demolished and replaced with a new, larger shelter attached to what was then Four Winds School (and is now Hope Academy) in the southeast corner of the park in 1992. 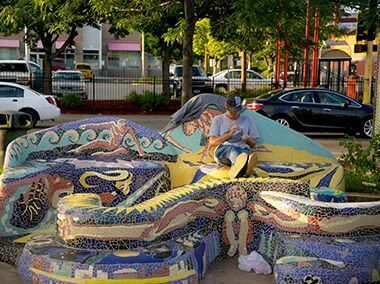 At about the same time the buildings on the most recent addition to Peavey Park, two lots at the corner of Franklin and Chicago, were demolished and converted into a new entrance to the park with brightly colored mosaic tile benches. Neighborhood revitalization funds contributed to the renovation. In one of the first steps toward implementing a Master Plan for the park, developed with the neighborhood in 2000, the tennis courts at the corner of Franklin and Portland were removed and the basketball courts rearranged and resurfaced. 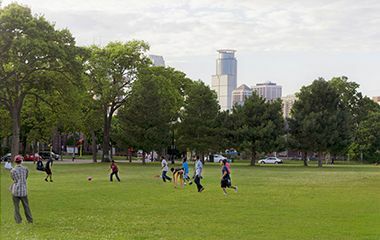 The name Frank Peavey appears another place in the Minneapolis park system. Frank Peavey donated a fountain to the parks, which he placed at the intersection of Kenwood Parkway and Lake of the Isles Parkway, in 1892. The Peavey Fountain was originally meant to serve as a watering place for horses. It was later designated as a memorial for horses that had died in World War I. Take a break at Peavey Park on the mosaic benches located on the corner of Chicago Avenue and Franklin Avenue. 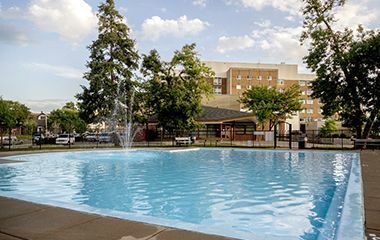 Cool off in the summer at the Peavey Wading Pool. See our other wading pool locations. The mosaic benches are located on the corner of Chicago Avenue and Franklin Avenue.